Lead time for this product is 1 - 2 Business Days. 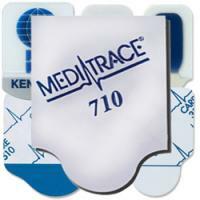 Provides a unique foam substrate design for long term and serial ECG's. Utilizes a patented conductive adhesive hydrogel which allows for excellent adhesion. Defibrillation recoverable and are latex-free. With one of the largest catalogs of medical, surgical and diagnostic supplies available online, Medex Supply can accommodate your facility's needs for Orthopedic Therapy. Foam Electrodes can be found in our extensive online collection of products from globally recognized and trusted brands, including Kendall. An excellent option to consider is the Care CA210 Diagnostic Tab Electrodes, 1" x 1 1/4", 100/pk. This product is shipped from our warehouse in Passaic, NJ, USA.